Decorate your nexus of buddy-hood with your best pal with ardor of mirth by ordering online this Triumphal Frolics Gourmet Gathering for the one. 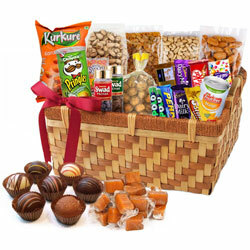 This jubilant Basket is filled with Cadbury Dairy Milk (1 Bar), Cadbury Dairy Milk Crackle (1 Bar), Cadbury Dairy Milk Temptation (1 Bar), Cadbury Five Star (1 Bar), Cadbury Gems (1 Packet), 1 Cadbury Perk, 1 Nestle KitKat, 50 gm Handmade Chocolate, 50 gm Cashews, 50 gm Raisins, 50 gm Almonds, 100 gm Dates, 50 gm Pistachios, 50 gm Wallnuts, 100 gm Mango Chocolate, Fruit Tree Mango Juice (1 Can), 1 small Can of Pringles Chips, Kurkure Peanut (1 Packet), Swad Pachak (2 Bottles), Polo Rolls (2 Sticks) and 50 gm Sugar Coated Fennel. Note: Basket design may vary depending on availability.